The smallest, most versatile metronome software available, and it's free! Weird Metronome is a program that acts as a metronome, displaying a blinker and using your computer's speakers to play its beat. But this isn't just any old metronome. I designed it with Easter European folk music in mind, so my main priority was to have it be able to play any weird meter you want. The result is that you can set it to play a measure of any length you want, with emphasis on any beat(s) you want, with sounds chosen from a library of nearly fifty percussion instruments. I also designed Weird Metronome to be compact and efficient. I stayed away from all the pretty buttons and displays that you'll see on other metronome software, because those just tent to make a confusing, unfamiliar interface that's too often painfully slow. Well, you can tell that this baby's no-nonsense right from the start. The interface is straightforward, clear, and easy to use. 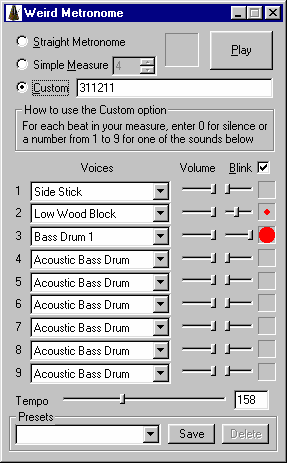 Finally, I wanted to make my metronome program free, because that's what I always wanted back before I made it. So it is! Please use it in good health, and I hope you get as much use from it as I and thousands of others do. I have to thank him for picking up where I left off, making changes on Weird Metronome when I've been to busy to work on it. I've certainly been thinking how great it would be to be able to use WM on a mobile device, and now you can! Next step: iPhone, baby! The new version of Weird Metronome has a few changes from the previous version, as well as a few fixed bugs. The biggest change is that I made it possible to play more than one note at a time in a given beat of the measure. Use parentheses to surround any numbers that you want to happen at the same time. For more information, see the FAQ or the readme that's distributed with the program. If you have problems using Weird Metronome, perhaps they're answered in the FAQ? It answers most of the questions I get about the program. This page and its contents are copyright ?2007 David Johnston. All rights reserved.